Once again six stalwarts of the Martin dale Cup were the only entrants for the third round, hopefully this was due to the atrocious weather in the morning where it persistently rained for most of it. 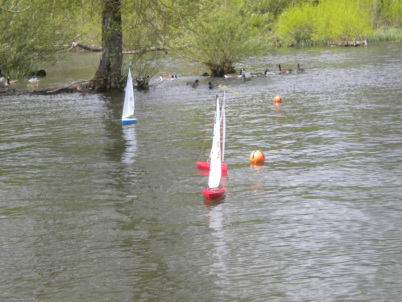 We were determined that our spirits would not be dampened and the six permanent markers were added to the lake and with the addition of one buoy to make a start gate a course was set around three of them. Some general confusion arose because of the additional marks for the first race with a number of skippers losing their way at times it seemed that the only person who knew what course had been set was the race officer, and so having crossed the line first he sportingly declared the race void and we started again. The course had a very tricky first leg with the first mark tricky to get around, this meant that the skipper who mastered this usually went on to win the race and so by lunch time we altered the course to try to add a better upwind leg in the second half of the race. Early on Mike Ewart (36) sailing his Dragon Force looked as if he was going to be the boat to beat all day however as the wind strength faded the Micro 540's started to come into their own, first to take a win from Mike was Peter Shepherd (165) with Abracadabra, then Peter Jackson (305), Wizard took race 4 and the rest of the M540 fleet sailed by as well, After a shaky start by his standards Paul Risdale (515), Gothic 54 started to put together his more usual consistent form scoring his first wins of the day in races 5 & 6, a bit of sail tweaking on Geoff Raygada's (395) Gothic 54 and he started to get better results taking his first win in this class in race 9, all the practice he is doing is really starting to pay off. Tim Lees (93) arrived later in the day joining in racing from lunchtime onwards although he was a hampered somewhat by a rudder issue which meant he wasn't really showing his true form, another skipper with technical difficulties was Peter Shepherd (165) Abracadabra who after sitting out race 12 worked out what was wrong and altered his set up to suit, race 13 wasn't great but then he went on to win the rest of the races, if only he had sorted the issue out sooner. The technical committee for the Micro 540 has had a meeting and the discussion regarding the single rig being overpowered in strong winds was on the agenda, a decision has been reach which was greeted with general approval by the assembled skippers to allow a single storm sail, this will have to fit within the extremity of the sail template outline and not be higher than 60% of the template height. Hopefully the addition of this sail will allow the boats to be sailed to their best effect in all conditions without creating the need for a multitude of rigs to be competitive within it. Despite the weather an enjoyable event was had by all the participating skippers, with half the fleet going home with plans to make new Micro 540's! The next Martin Dale Cup event is back at Daventry Country Park on 28th June2014.